With a robust and ever-expanding global database of 700 000+ titles, Libnet is perfectly designed to fit your library. 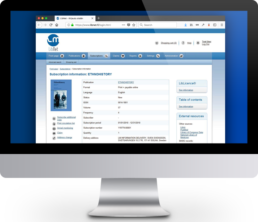 It is suitable for libraries, information centres, organisations and corporations of all sizes and is available to use in English, Swedish, Finnish, Norwegian, Danish, Dutch, Spanish and French. An intuitive and easy-to-use interface that makes managing your subscriptions seamless, simple and streamlined. 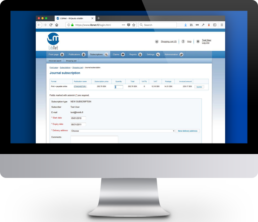 All functions related to subscription management, including publication search, subscription holdings, journal check-in, circulation lists, claims, renewals, reports, budget tools etc. Journals can be browsed via basic or advanced search. Publication data includes a journal description, cover picture, name, price, ISSN number, frequency, current volume and information needed for licensing and registration of e-journals. The system also indicates whether or not the magazine has already been subscribed by the customer. Easily and efficiently order all your journal subscriptions online, in multiple formats. Streamline and simplify the renewal process with Libnet. When you renew or update your subscriptions via Libnet your renewals are activated automatically, without delays caused by manual processing of renewal forms. You will receive an automatic notification when your subscription period is up for renewal, simply log in to Libnet and renew in a few clicks. Place claims and monitor the progress in real-time. View the entire handling process of your claim, including actions taken by publishers and your customer service representative. LibNet® offers vast reporting possibilities. The reports can be tailored according to the requirements of each customer. The most common reports are the Subscription report, E-publication report, Price projection report, Claims report, E-publication availability report and the Frequency Report. Reports are available in Excel and PDF -formats. Easily configurable to create multiple administrative accounts for customers with various campuses, branch locations, business units etc. Authorization levels can be easily set according to the needs of different users. Easily edit any account details such as contact details or invoicing information directly from Libnet. Cyber security and data protection are paramount to us and with Libnet, your information is always secure. The entire platform has been designed following the best practices for application security. All communications are protected with TLS encryption and in addition to standard username and password you can also use multi-factor authentication. Would you like to know more about Libnet?